Messenger bags are a good alternative to backpacks (which are pretty common). Aside from fashion and personal preference purposes, travelers also choose messenger bags for functional reasons. These bags can provide easier accessibility while you’re on the go. In fact, the best messenger bags can even surpass the aesthetics and usability of the backpacks in many cases. Long before travelers and adventurous bikers are carrying messenger bags, couriers and linemen were already using them. Whether in long road trips while biking or in climbing up the utility poles, messenger bags allow couriers and linemen to readily access the mails and their tools. They just have to bring the bag out front from the back (even without removing the strap) and then bring it again to the back easily whenever they’re ready to move again. Contrast that with backpacks wherein you have to wear and remove the shoulder straps whenever you need something. That’s why many travelers and bikers prefer a messenger bag over a backpack in some of their adventures. If you’re planning to have a messenger bag (or wondering whether it’s the better option than the backpack), in this guide I’ll discuss when to choose a messenger bag and where it’s best used for. I’ll also discuss what features to look for and finally mention the features of some of the most popular messenger bags in the market. Let’s start. As discussed earlier, messenger bags can provide fast and easy access to our items especially when we’re always on the go. However, these bags have one major drawback you should take note. Messenger bags can only carry fewer items than backpacks. This means you can only carry the essentials. That’s why it’s important to focus on the things that you truly need while on the road. It’s also important to carry items that take less volume. If we think of it another way, that drawback can actually be the best feature of messenger bags. In both long and short trips, we often favor less weight and less bulk. Messenger bags fulfill those requirements. Another noticeable drawback from using messenger bags is the unsymmetrical weight distribution. Contrast that with backpacks where the weight is distributed evenly. Backpacks also offer flexibility because you can use it for any of your travels. The easier accessibility provided by messenger bags somehow compensate for their drawbacks. Whenever you need something, you can easily pick up the item without taking off the messenger bag. If you’re wearing a backpack, it can be a bit awkward because you need to take it off. This can be a hassle especially if you’re in an inconvenient position or in a tight space. Still confused of what to choose? Actually, you can use both depending on your current journey. If you’re hiking and camping, you can use the big backpack to carry all your items. While you’re camped, you can use the messenger bag to explore nearby areas. You can use it to vary your gear and separate the essentials from the secondary items. What Makes A Quality Messenger Bag? Adjustability of the shoulder strap: The shoulder strap should work perfectly if you want the messenger bag to serve its purpose. You should also be able to easily adjust the fit so you’ll stay comfortable. There are messenger bags that are hard to adjust once they’re set. There are others that can be easily loosened or tightened even with the use of just one hand. The adjustability is important because we often wear different outfits for different occasions. One day we might be wearing thin clothing and the next day we require a thick one to protect us from cold. We will need to adjust the shoulder strap of the messenger bag for each occasion. Also, the size of our bodies doesn’t remain constant over time. We might be slowly gaining or losing weight and hence our body size is also changing. We then need to adjust the shoulder strap for us to remain comfortable. The padding: Aside from adjustability, another feature related to comfort is the padding in the shoulder strap. I mentioned earlier that a messenger bag provides unsymmetrical weight distribution. It can cause some discomfort and strain especially if you’re carrying it for hours while walking or biking. But with padding, you will experience more comfort while carrying the bag. Crossbody strap for stability: Because of the messenger bag’s single strap, you might feel some dangling at your back or at your side especially when you’re moving a lot. That’s why companies included a crossbody strap to help with the security and stability. It works similar to the “belt” you strap while wearing a backpack. For some people, a crossbody strap can be uncomfortable. Many messenger bags have a removable crossbody strap so it’s only optional depending on your comfort level and personal preferences. Weatherproof: In many travel gear, weatherproofing is important. Messenger bags are no exception. In our journey, we might be carrying a little notebook (to record our thoughts and explorations), a pen, a laptop, and a mobile phone. We need to protect these items from an adverse and unpredictable weather. That’s why we also need to check if the messenger bag is weatherproof before we purchase one. Organized interior: We’ve discussed the important exterior features you should look for in messenger bags. Next is we discuss the interior. Travelers like lighter and less bulky things. As a result, we will often carry small items. These items can be hard to access to if they’re all mixed up inside the bag (which defeats the purpose of the messenger bag). That’s why many messenger bags include an internal organizer for pens, phones, cords, water bottles, and other items. Each area can be devoted to one specific item. This way, it will be easier to pick up a thing whenever you need it. In just a few seconds, you can pick up your pen or phone without your hands rummaging inside the bag. Those are the things you should check first before buying a messenger bag. To further help you in choosing the best one, I also prepared some reviews about the popular messenger bags available in the market. Description: The Timbuk2 Command Laptop Messenger Bag is great anyone looking for quality and sophistication. A pioneer of made-in-America customization designed and manufactured this. Aside from quick access of your powerbrick or cords through an external access zipper pocket, you can also send the bag through security without removing the devices. The messenger bag also has a luggage pass through so you can easily attach your roller bag. It’s made from 100% polyester, which makes this messenger bag durable, strong, and resistant to many elements. It can also effectively protect what’s inside (especially the laptop, tablet, and other gadgets). Whether in comfortable or adverse weather, the Timbuk2 Command Laptop Messenger Bag is great for those in urban travel and other outdoor settings. Description: The Chrome Unisex Night Series Buran Laptop Messenger is made of weatherproof 1,000 denier nylon outer shell. Sounds military isn’t it? This was made with durability and quality in mind. Aside from an excellent exterior, this messenger bag also has a spacious main compartment. It’s ideal if you always carry your laptop, wallet, keys, small personal electronics, and other daily essentials. There’s also a padded laptop sleeve (which is built-in) wherein you can fit even a 17-inch laptop. For those fast and adventurous bikers, the bag’s stability can be a problem. That’s why this bag has a cross-chest load stabilizer. This will make the riding experience much smoother. The reflective front panel (that’s why the name has Chrome in it) is also useful for low light settings. However, the chrome panel can peel off after some use. In addition, during maintenance you might need to spray lubricant inside the buckle to keep it working perfectly. Good thing though is the buckle has a quick release feature (which is very convenient). It doesn’t slip easily and your bag is secure even when you’re moving a lot. Description: The Osprey Men’s FlapJack Courier Day Pack has a clean and modern look. Aside from the elegant style, both the exterior and interior details are intuitive and useful. This clearly satisfies the need of travelers and bikers when it comes to aesthetics and functionality. The fabric is durable and soft to the touch as well. Just like with the messenger bags mentioned above, the Osprey Men’s FlapJack Courier Day Pack also has a stabilizer (looking like a hip belt). This way, bike riders can experience an enhanced and smoother ride. It’s in a good price, but doesn’t sacrifice on quality and convenience. You will also have an organized interior where you can put your daily essentials. In the accessible side pocket, you can carry different sizes and types of water bottle. This will help you easily access your water source to stay hydrated while on the go. Description: This is designed for the all-weather commuter. It’s made from 600D polyurethane coated polyester body. It can withstand different types of weather without showing deterioration and compromising your personal items. Its perfect PVC-free exterior is good for all conditions. Backpacks and other messenger bags can cause you to sweat profusely on your back. There’s no air circulating and it can be a huge problem especially when you’re wearing the bag for several hours. That’s why in the SealLine Urban Shoulder Bag, it has a breathable back panel. You will stay comfortable and fresh even wearing the bag for hours. This messenger bag is not that popular compared with other brands. But its focus on comfort is what makes it a choice for many other bikers and travelers. Description: The Chrome – Unisex-Adult Metropolis Bag has a sturdy feel as reported by some of its users. In addition, it has a spacious interior where you can fit all of your daily essentials while having some more room for your other items. The bag overall looks simple. But the feel can be soft and luxurious especially in the shoulder strap. It has a unique feel compared to most of the messenger bags out there. One important thing you should take note is that it’s best worn around the left shoulder. It’s in the design. It might feel uncomfortable at first. But as you get used to it, it will feel great to wear. There are more popular messenger bags than this one. But its simple look and luxurious feel makes it appealing to many other customers who love biking and travelling. Description: The Patagonia Half Mass Messenger Bag is made of 600-denier 100% recycled polyester (with a polyurethane coating). This is especially built for bike commuters. Its contoured base provides structure and protects the contents. The bag (in the padded computer sleeve) can accommodate most 15-inch laptops. The padded electronics pocket can protect your valuable items. There’s also an external side pocket wherein you can store your mobile phone or water bottle for easy access. Aside from short bike trips (for frequent travelers and bikers, ‘short’ can actually mean very long distances), this bag can be also appropriate for those taking international trips. The reason is it can take a lot more than just pens, paper, and laptop. Travelers are especially thankful for this because of its interior drop pocket. You can easily put and access your boarding passes whenever you need them. I discussed earlier the importance of accessibility and that feature makes this bag unique among the rest. Specifications: Two zippered pockets and one open pocket underneath the flap. Additional small zippered pocket inside the main compartment. Description: The Manhattan Portage New York Messenger Bag is tough and spacious. It offers up to 1,800 cubic inches of storage. You can put your books, notebooks, laptop, and other items. It’s also tough because of the high-quality Cordura Plus nylon where it’s made of. This means the bag can last through the years (even with heavy use). Strength and durability is important. This messenger bag highlights those important factors. It’s secure and you won’t have to worry about the contents spilling out while you’re biking or moving a lot. Aside from security, the bag also emphasizes comfort. The shoulder strap feels soft which makes the bag comfortable to wear even for many hours. The Manhattan Portage New York Messenger Bag is great for those going to school and travel. However, opening and closing of the flap can be far from smooth. This is especially the case when you’re in a tight or cramped space. That scenario will be common for people riding a bus or a train (where there’s not much free space). 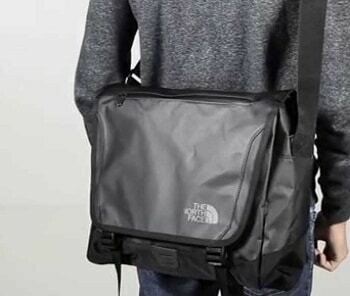 Description: The North Face Base Camp Messenger TNF offers a lot of flexibility to meet the needs of different users. For example, the shoulder pad and the hip belt can be removed if you’re not comfortable with them. You can also easily sling the bag over your shoulder while putting it in the side. As with most messenger bags that emphasize safety, there’s also a reflective panel for visibility. This feature is important especially for bike commuters. Another important feature is its perfect size. It looks compact but it can actually store your daily essentials and other important items. When it comes to design, its black color can complement almost any outfit. The bag’s flexibility actually extends to both its use and look. For most purposes and as a replacement for backpack, this messenger bag will already suffice for many users. Instead of wearing a backpack, why not try a messenger bag? The messenger bags mentioned above can vary your travel gear and also provide you with greater accessibility to your items. If you’re now planning to purchase a messenger bag, keep in mind your needs and preferences. There’s no one-size-fits-all, especially when it comes to travel gear. You have unique needs and taste which will help you choose the right messenger bag for your regular use, and hopefully this article has helped you to figure out what those are. Please feel free to leave comments or share your stories with us in the section below.